At his luxurious castle, the Marquis Evrémonde waits for the arrival of his nephew, Charles Evrémonde (a.k.a. Charles Darnay) from London. Charles explains he has been questing for a "sacred object," but that he's run into trouble. The Marquis dismisses him, but complains that the power of the French aristocracy has waned. They used to hold the right of life and death, and ruled by fear and repression. The object of Charles's sacred quest is Lucie. Charles' "trouble" in winning her love is his aristocratic background. Notice also the contrast between Lucie and the aristocracy: she has the power to restore life, while the French nobility rule through the power of taking life away. Charles responds that the Evrémondes have lost their family honor by injuring anyone who stood between them and pleasure. He adds that when his mother died, she commanded him to have mercy on the people. He renounces his family name and property, which he says is cursed, and explains that he will work for a living in England. The Marquis scoffs at his nephew's "new philosophy," tells him to accept his "natural destiny," and goes to bed. The "new philosophy" of the Enlightenment, which inspired both the American and French Revolutions, held that all people are born equal, that no one has a natural right to rule. Yet rather than facing his past, Charles tries to run from it by renouncing his family and living and working in England. As the morning dawns, the expressions on the castle's stone faces seem to have changed to shock. Bells ring and villagers gather to share urgent news: the Marquis has been found dead with a knife in his chest and a note signed "Jacques." The stone faces represent the old institution of the nobility, shocked at the unthinkable: a challenge to their power. Yet the murder also shows that despite their ideals, the revolutionaries are as bloodthirsty and revenge-driven as the nobles. Fyfe, Paul. "A Tale of Two Cities Book 2, Chapter 9." LitCharts. LitCharts LLC, 22 Jul 2013. Web. 11 Jan 2019. Fyfe, Paul. "A Tale of Two Cities Book 2, Chapter 9." LitCharts LLC, July 22, 2013. 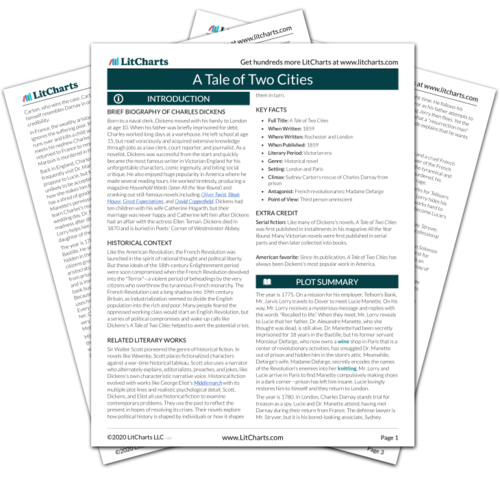 Retrieved January 11, 2019. https://www.litcharts.com/lit/a-tale-of-two-cities/book-2-chapter-9.